Contestant FAQ If you need help or are having problems entering any campaign Powered by Gleam then this FAQ should answer the most common problems users face. When you enter a Gleam campaign for the first time you can login with your Name & Email address. However, once you connect any social account we add a layer of verification to your account to prevent another person logging in as you. The easiest way to think of this is that any social account you've connected to Gleam can act as your password to log in again once you've logged out. One of the most common queries we receive is a user unable to login once they receive the prompt above. 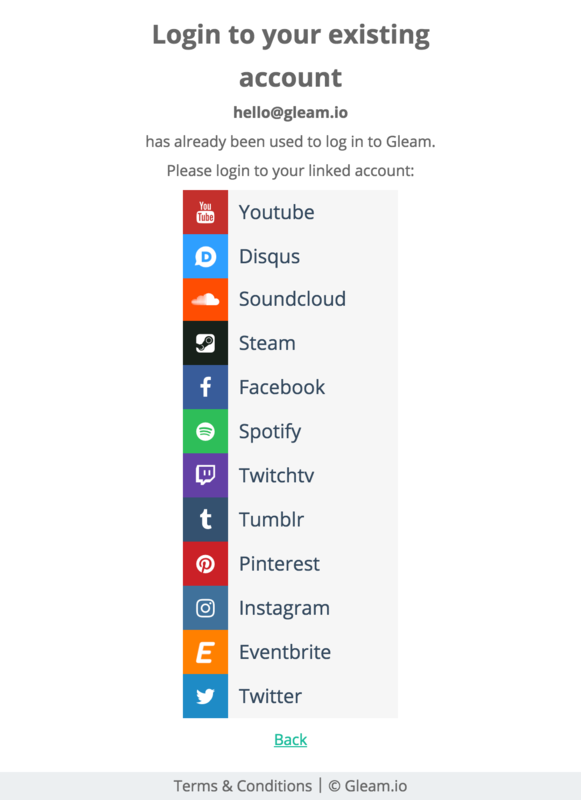 Since these accounts act as your password you must login with one of the social accounts you've previously used with Gleam (and the associated email address you are trying to use). If you don't use the proper account, then you'll be forced to try and login again. This is often perceived a login loop as (for security reasons) we don't specifically tell you which account to use or if it was incorrect. You can contact us here from the linked email address if you are still having issues (for example your linked account has been deleted and is preventing you from logging in completely). Please provide as much information as possible otherwise we'll be unable to assist. Gleam uses connections with various social networks to automate and improve the experience for both entrants and owners of the campaign. On this screen you will see which Social Accounts are connected. Firstly, ensure that the account you are using matches the one that is connected on Gleam. If not, then you will need to switch accounts or remove the connection from Gleam and reconnect the new one. The same goes for deleted accounts, you will need to remove the old account from the Gleam edit screen and then link your new one next time you complete an action that uses that provider. This prompt will show when we see a certain amount of spam activity from a specific IP address, you'll typically see this prompt if you share your IP with a lot of other entrants or use a VPN. Campaign owners have the ability to enable a Throwaway account check for Twitter to reduce the number of poor quality accounts entering. If you're seeing this error then you should consider improving the quality of your profile and setting it up to look like a real user. How Do I Reconnect a Social Account? You can edit and see which accounts are connected to Gleam via the Edit tab on the widget. This tab also allows you to remove any accounts from Gleam at any time. To reconnect an account after removing it you must complete an action inside a campaign that requires that social account to be connected again. You may be trying to change your email address inside Gleam but getting an error that the account is already in use. This essentially means that you have already previously created or entered a Gleam campaign using the email address you want to change to. Since that account exists, you cannot update the email address on your current account to one that is already in use elsewhere. You will need to log back in with the old account, then use the Edit screen to remove any associated social accounts from the old address, then login with the new address and reconnect them. Some competitions require you to enter your date of birth to verify your age. The organiser has the ability to set this up in UK or USA format. Make sure you are entering your Birthday using the requested format, which may vary based on location. Day first DD/MM/YYYY and month first MM/DD/YYYY are sometimes confused (depending on your location). How Can I Turn Off The Post Entry Emails? There's an unsubscribe link at the bottom of all emails that we send, just click on that to turn off all post entry emails. How Can I Remove My Information From Gleam? We're committed to ensuring your privacy, if you wish to completely remove your data from Gleam just shoot us an email to privacy@gleam.io. Once we verify that you're the owner of that address we'll remove your data and notify you when complete.